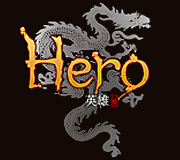 In Hero online there are currently 4 jobs in the 1st promotion (Warrior, Physician, Assassin, Hunter). To promote the character will have to accumulate 1 Dan and the promotion NPC is located within the Dragon Castle southern extremity (around Lord Sagun). When you get promoted you will receive the promotion skill/divine skill. 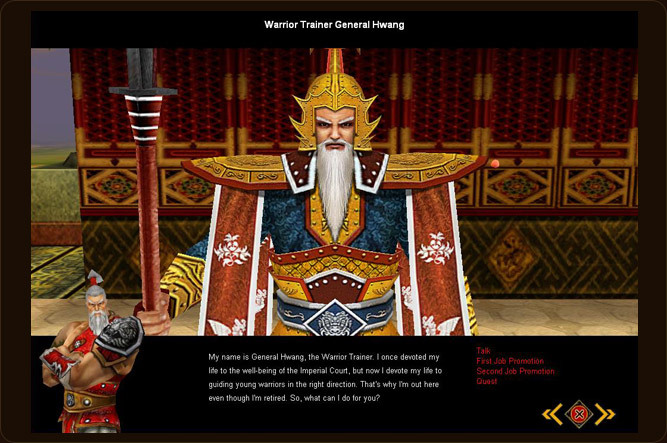 The warrior trainer General Hwang is located on the left side of Lord Sagun and when a player gets promoted as a warrior, it will receive skills such as prayer of warriors and the new skill Vigor of the Bear Skill. The prayer of warriors will increase the attack power along with the defense power and the Vigor of the Bear will increase the character’s HP. 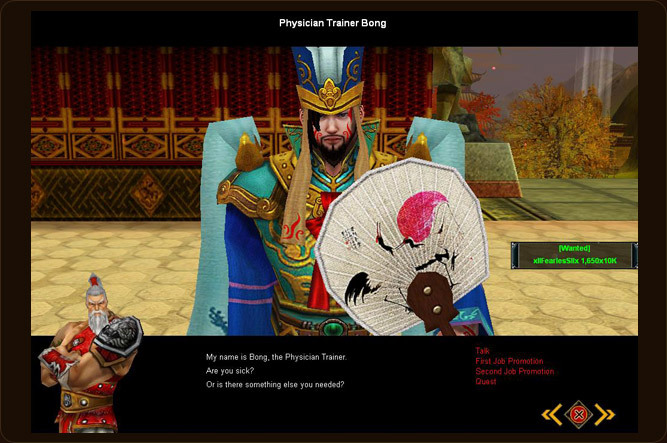 Physician Trainer NPC Bong is on the left side of Lord Sagun and when a player gets promoted to a physician, it will receive skills such as the physician skill and the new skill Wisdom of the Owl. The physician skill has 4 forms. Touch of Heal Heals self and ally. Antidote Heals self and ally’s abnormal condition. Touch of Paralysis Paralyzes touched target. Touch of Cleansing Cleanses self and ally’s blocked energy. * The new skill Wisdom of the Owl increases max chi and skill defense. Assassin NPC, Assassin Trainer Bing, is located on the right side of Lord Sagun. When a player gets promoted to a assassin, the skill they will receive is Assassin skill and the new skill, Talon of the Hawk. The assassin skill is in 3 forms, reference to the chart below. Move of Disguise Hides self from the enemies eyes. 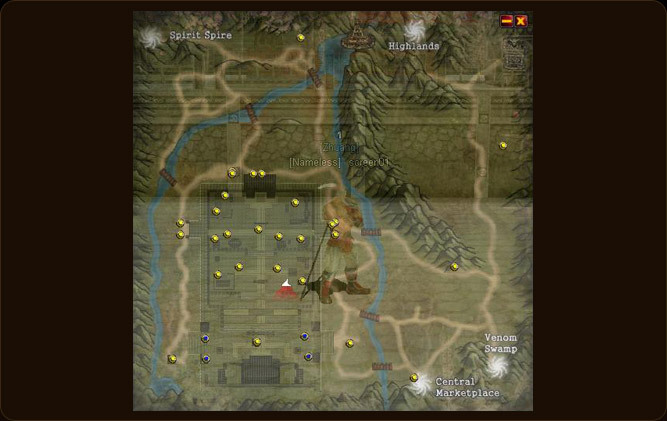 Detection Skill Finds the hidden enemies. Move of Extortion Drains the HP of touched target. * The new skill Talon of the Hawk increases dodge and attack rate. 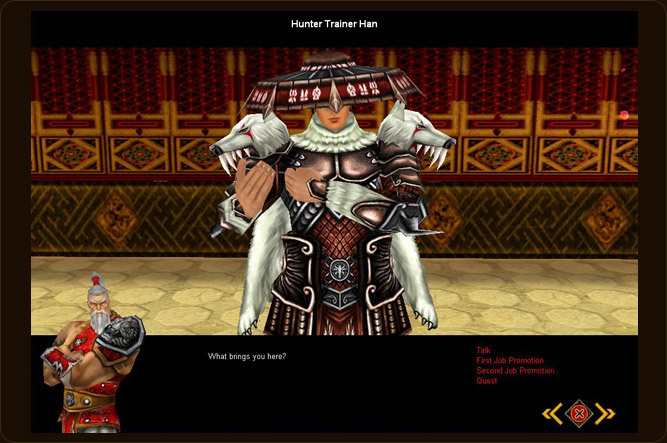 Hunter NPC Han is on the right side of Lord Sagun and when promoted to a hunter the skills that the player will receive are, Hunter skill and the new skill named Hardness of the Tortoise. The hunter skill has 1 form, reference to chart bellow. * The new skill Hardness of the Tortoise increases the character’s defense.